Richard Goldstone's repudiation of the eponymous blood libel he authored in 2009 provides a number of lessons about the nature of the political war against the Jewish state and how we must act if we are to defeat it. Learning these lessons is an urgent task as we approach the next phase of the war to delegitimize us. By all accounts, that phase will culminate in September at the UN General Assembly's annual conclave in New York. As America marks the 10th anniversary of the September 11 jihadist attacks, the Palestinian Authority's well-publicized plan to achieve UN recognition of a Palestinian state in all of Judea, Samaria, Gaza and northern, southern and eastern Jerusalem will reach its denouement. The UN Charter spells out the procedure through which new states receive membership. The procedure dictates that the Security Council must recommend to the General Assembly that a state receive membership. Following the Security Council recommendation, the General Assembly calls a vote. If two-thirds of the UN member states vote in favor of recognition, a state is accepted as a member state. In the Palestinian case, General Assembly support is a forgone conclusion; 118 out of 192 UN member nations already recognize "Palestine." Legally the General Assembly cannot act without Security Council sanction. So if the US vetoes a Security Council resolution on the issue, the General Assembly would be formally barred from moving forward. But legal norms applied to the nations of the world are rarely applied to the Palestinians. Consequently, it is possible that the General Assembly will illegally vote on Palestinian statehood even without a Security Council recommendation to do so. OVER THE past year or so since this new Palestinian plan to delegitimize Israel began coming into view, a swelling chorus of doom and gloomers has warned that if the General Assembly recognizes "Palestine," in Judea, Samaria, eastern, northern and southern Jerusalem as well as the Gaza Strip, it will be a disaster. Defense Minister Ehud Barak has called it a "diplomatic-political tsunami." The New York Times claimed Sunday that it "could place Israel into a diplomatic vise" as "Israel would be occupying land belonging to a fellow United Nations member." 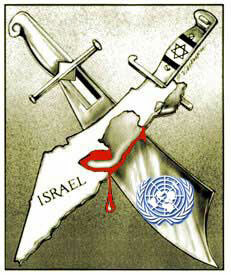 Certainly it is true that we will not benefit from such a UN action. But the fears being sown by the likes of Barak and Haaretz columnists are overwrought. The fact is that while acceptance of "Palestine" as a UN member state will be a blow, it will mark an escalation not a qualitative departure from the basic challenges we have been facing for years. Europe already claims that by maintaining sovereignty over its capital and control over its heartland in Judea and Samaria, Israel is illegally occupying the Palestinians' land. So does the Obama administration. As we approach the September deadline, the question we need to consider is what the concrete consequences of Palestinian membership in the UN would be? What new anti-Israel activities will international organizations and states engage in following such a move? And how can we meet those challenges? In general, the acceptance of "Palestine" will present us with new threats from three different actors: the International Criminal Court, the EU and the US. If "Palestine" is accepted as a UN member nation, we have been warned, it will join the International Criminal Court and file war crimes complaints against us. While this is probably true, the fact is that even without the prerequisite UN membership, the Palestinians have already filed war crimes complaints against us at the ICC. Although "Palestine" must already be a state for the ICC to entertain the complaints, it has not rejected them. But two can play this game. Say "Palestine" joins the ICC. Even if Israel remains outside the treaty, it can use its membership against it. Both Fatah and Hamas have committed innumerable war crimes. Every terrorist murder and attempted murder, every missile, mortar shell and rocket fired is a separate war crime. And every terror victim has the right to file war crimes complaints against "Palestine" with the ICC prosecutor. As to the Europeans, the fact is that they have already joined the Arab onslaught on the international diplomatic stage and they have already imposed limited economic sanctions. They have set aside negotiations on upgrading the EU-Israel Economic Association Agreement. Several EU member states have unofficially enacted trade boycotts. Britain, for instance, implemented an unofficial arms embargo several years ago. Looking ahead, we need to consider how they may escalate their hostile behavior and develop plans to minimize the damage Europeans can cause the economy. Unfortunately, the chattering classes are behaving as though when faced with the specter of further European economic sanctions, we have no option other than to throw ourselves at Europe's feet and beg for mercy. But this is ridiculous. AS THE 18 years since Oslo have shown, begging Europeans for mercy on the basis of concessions to the Palestinians is a losing strategy. Europe is not interested in displaying mercy toward the Jewish state, and it does not view any concessions as sufficient. But Europe does respond to power politics. With India now producing cars and Israel developing its own natural gas and shale oil fields, it is the job of the government and business leaders to make the Europeans think long and hard about how willing they will be to alienate our consumers and businesses. This brings us to the US. Prime Minister Binyamin Netanyahu's greatest fear is that President Barack Obama will fail to veto a Security Council resolution recommending General Assembly approval of Palestinian membership in the UN. The gloom and doomers advise the premier the only way to avert this prospect is to render such a resolution superfluous by preemptively capitulating to all of Obama's demands. Obama has let it be known that he expects Netanyahu to announce his surrender in an address before both Houses of Congress in May. And this makes sense from his perspective. If Netanyahu gives a speech before Congress in which he effectively embraces Obama's anti-Israel positions as his own, he would make it practically impossible for Republican lawmakers and presidential candidates to criticize those policies. Perversely, if Netanyahu bows to Obama's wishes, he will not avert US support for Palestinian UN membership and UN recognition of Palestinian sovereignty in Jerusalem, Judea and Samaria and Gaza. He will facilitate it by making it appear noncontroversial. Netanyahu's best bet in this case is not to ask Obama for favors. Since the General Assembly will likely approve Palestinian membership even if the US does veto a Security Council resolution, Obama's ability to prevent the gambit is limited. And the price he wants to exact for a veto is prohibitive. AND THIS brings us back to Richard Goldstone. His repudiation of his own report did not happen in a vacuum. Goldstone's admission Friday that his report's central conclusion — that Israel committed war crimes in its campaign against Hamas in Gaza — was wrong is a case study in how we must contend with difficult political challenges if we are to emerge victorious in the political war. The fate of Goldstone and his report hold several vital lessons for our leaders. The first lesson then is never to surrender or give any quarter to lies. We greeted Goldstone's mendacious report on Operation Cast Lead with justified indignation and furor and never backed down. In the face of the massive international pressure that followed his presentation of his lies, we stood our ground. Our behavior denied Goldstone and his cronies the ability to portray his mendacious report as the unvarnished truth. Because of this reaction, from the beginning it was clear that its findings were at best dubious. The second lesson is that the government must hold firm. In the Internet age when everyone can have a say, the most important commodity a person can have is legitimacy. The government confers legitimacy on its defenders and so empowers them to take action. If the government had capitulated to Goldstone, half the voices attacking his blood libel would probably have never spoken out or been heard. The third lesson from the Goldstone experience is that people make up governments and people make policies. Since people are social animals, the social sphere is a critical one in foreign affairs. Our diplomats and leaders tend to act as though the only possible goal of their personal relations with other diplomats and leaders is to make the foreigners love them. The Goldstone case study shows us that as Machiavelli taught, it is just as good if not better to be feared. When Goldstone issued his tendentious report, he no doubt assumed he would suffer no personal consequences for claiming IDF soldiers and commanders are war criminals and that Israeli Jews are neurotic. After all, everyone libels Israel and gets away with it. But rather than get a pass for his behavior, Goldstone got ostracized. Following the government's lead, Jewish activists throughout the world attacked him for his lies. Everywhere he went he was challenged. Obviously, these attacks had an effect on him that attempts to appease him would not have had. The final lesson of the Goldstone experience is found in the fact that the publication of malicious slander did not paralyze the country. The IDF continued to strike Hamas targets. Fear of more lies from Goldstone and his Israel-bashing associates did not convince the government to stop defending the country. Israel is being challenged by a political war that escalates every day. But we are not powerless in this fight. As we prepare for the Palestinians' UN gambit, we must keep in mind the lessons from Goldstone. If the government remains faithful to the truth and to our rights, it will empower our supporters throughout the world to rally to our side. If we are good to our friends and bad to our enemies, we will know how to reward our friends and punish our enemies. And if we boldly assert our rights even in the face of international condemnation, we will see that in the fullness of time, the rightness of our position will carry the day.